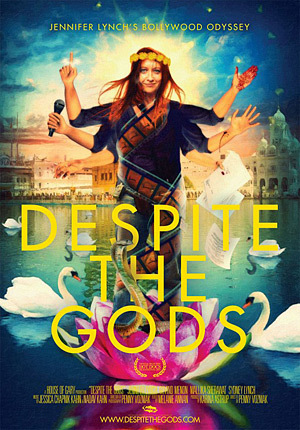 Despite the Gods (Director: Penny Vozniak): Australian filmmaker Penny Vozniak had originally signed on to Hisss, a Bollywood production, to shoot content for the movie’s DVD extras. Early on in the process, she discovered a creatively richer opportunity in documenting the tribulations of director Jennifer Lynch (daughter of filmmaker David Lynch). Lynch’s career story in and of itself is pretty interesting: after the critical evisceration that greeted Boxing Helena, her 1993 debut film, the then 25-year-old retreated from Hollywood until returning 15 years later with the little-seen Surveillance. With work scarce, Lynch agreed to move to India for three months with her 12-year-old daughter in tow to direct the decidedly undignified story of an Indian snake goddess, starring Bollywood superstar Mallika Sherawat. Hisss bloatedly incorporates aspects of seemingly every film genre, save for the one that Despite The Gods director Vozniak employs to capture Lynch’s experience directing it. The potent combination of Lynch’s highly charismatic personality, her comfort with Vozniak’s omnipresent camera, an admirable dedication to her craft (even when it’s based on bottom-of-the-barrel material), and the numerous instances of adversity encountered by the director throughout the shoot should make for more compelling viewing than Despite The Gods actually delivers. About halfway through, the documentary seems to lose a bit of steam, unable to draw more from circumstances like Lynch balancing her motherly responsibilities while dealing with unpredictable weather, a meddling assistant director, inexperienced crews, cultural barriers, and a wearying eight month shoot, which was five months over schedule. These scenarios prove to be more challenging than outright disastrous, resulting in an observational doc that doesn’t quite have the engrossing qualities of, say, Lost In La Mancha, which chronicled director Terry Gilliam’s doomed film about Don Quixote. Lynch’s entertainingly brassy temperament and refreshing candour always keep things watchable, though, and she quickly becomes a protagonist with whom the viewer empathizes. The documentary’s “struggling single working mother” theme should also expand its appeal to more than just buffs of the process of filmmaking. Lynch ultimately disassociated herself from Hisss after creative differences with producers during the film’s post-production. At the Q&A following Despite The Gods‘ world premiere screening at Hot Docs, she said she still hasn’t seen the movie, which came out in October of last year. Considering the small portion of the finished product that we see in the documentary, distancing herself from Hisss (I feel ridiculous typing that extra “s”) is undoubtedly a smart move – the acting is terrible and the CGI is downright laughable. Things look to be on the upswing in Lynch’s career, as her next project (starring Vincent D’Onofrio) has been completed and another (starring Tim Roth) is in pre-production. Despite The Gods might labour at times wringing substantial drama from Lynch’s film adventure, but it’s still a worthwhile viewing experience that presents an interesting fish out of water story, as the director’s second-act career arc unfolds. This entry was posted in Documentaries, Film Festivals, Hot Docs and tagged #hotdocs12, bollywood, filmmaking, horror, india. Bookmark the permalink.